The next Apnea Academy Instructor Course in English is programmed from the 14th to 20th of October 2018, in La Caleta, in the south of the island of Tenerife, Canary Islands (Spain). The duration of the course is 7 days. The Instructor Course will address topics of relaxation, breathing, physiology of respiratory and ear systems, diet, techniques of communication, teaching methods, psychology and group control, with lectures given by expert specialists in each field. Furthermore the AA teaching system, its standards, and the sequence of exercises will be discussed. 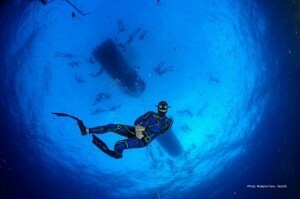 Theory of Static and Dynamic apnea, Constant and Variable Weight freediving will be treated. Practical exercises will include techniques of breathing and relaxation at the various levels, group control in pool and sea. All students will be filmed in order to analyze their technique. The course places emphasis on the formation of an instructor as much as the development of their technique and performance. For all sea sessions will be used the AA West Europe Freediving Center located at La Caleta. 8 minutes walking from the Apnea Center, the Tenerife Top Training Center ( www.tenerifetoptraining.com ) will host all pool sessions, theory lessons, breathing and relaxation sessions. For the Instructor Course, we suggest to the candidates Hotel Hovima Jardin Caleta (https://www.hovima-hotels.com/en/hotels-in-tenerife/hovima-jardin-caleta.html) because it’s cheap and very close to the Apnea Center and TTT. In any case, anybody is free to go where He prefers. Candidates will receive a specific form with all costs, contacts and information for reservations. As you can see from the satellite-map attached, the Hotel (the red star in the map attached), the Apnea Center (the red circle in the map attached ) and the Tenerife Top Training Center (the red square in the map attached ) are all very close. If you like to check the area, on Googlemap ‘La Caleta, Tenerife’. Other than Umberto Pelizzari, the teaching staff will be made up of some of the most respected experts in the various relevant fields and a selection of the most expert Apnea Academy Instructors. Also Carlos Coste, Stig Severinsen, WilliamTrubridge, Miguel Lozano, Sara Campbell, Manolis Yankos and and many other champions are Apnea Academy Instructors. Instructors who are successful in the evaluation at the end of the course will become members of the Apnea Academy and will be able to hold AA freediving courses of 1 st , 2 nd and 3 rd level, Apnea Discovery and Apnea Stages, within the teaching structure of the Apnea Academy, school for the instruction and research and freediving. All AA courses and stages are at this link. The organisation will supply successful students with the official Apnea Academy uniform at the end of the course. Monofins can be used, but are not obligatory. Traditional freediving bi-fins are however compulsory to the course.